Dr. Larry S. Crumpler is the Research Curator of Volcanology and Space Sciences at the New Mexico Museum of Natural History and Science, as well as an Associate Professor at the University of New Mexico. 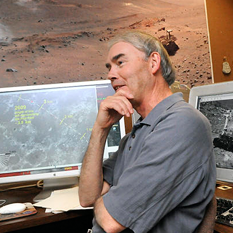 Larry has participated in many NASA planetary missions over the years, including the Viking, Pathfinder, and Mars Exploration Rover missions, and Magellan synthetic aperture radar mapping missions to Venus. Currently he is a Science Team Member on the Mars Exploration Rover (MER) mission where he continues to play a leadership role in daily planning of Opportunity's "natural history" exploration of the surface of Mars. He is also a Science Team Member on the Mars Reconnaissance Orbiter High-Resolution Imaging Science Experiment (HiRISE). 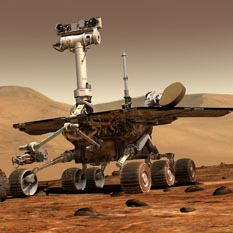 He was also a collaborator on the Mars Odyssey orbiter Gamma Ray Spectrometer (GRS) instrument. Larry's current research is divided between two topics: 1) young volcanic terrains in both New Mexico and Arizona, specializing in the physical processes of volcanism, particularly the relatively unstudied volcanology of late Cenozoic basaltic volcanism in New Mexico; and 2) geology of the terrestrial planets, with emphasis on planetary volcanism. His field work has focused on geologic mapping of youthful volcanic terrains and the physical volcanology of lava flows. He has spearheaded several public education efforts in regional volcanism and local geology.